Twitter has introduced a new feature which hides the multitude of replies when checking out another user's profile page. The new functionality, which has only been added for verified accounts, means all of those context-less replies can be kept from plain sight. When you head over to the page you'll now see an option to view All or No replies. 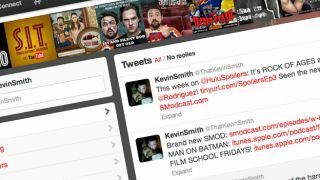 That means when you visit a prolific member's profile page, especially one who is very active when replying to fans like Kevin Smith, you'll can choose to view only his original proclamations. There's no word on whether Twitter will roll this feature out to the great social networking unwashed or whether it simply plans to keep this feature for the more illustrious members of the Twitterati. We can think of a few of our friends we'd like to try it out on.